Isabel Hunt rode Maffit Lake's Blue On Bye. They were Champion 11/U equitation, Reserve Champion Large Childrens Pony Hunter and the winner in the $500 Marshall and Sterling Childrens Hunter Pony Classic. Libby LeStage won a Junior Hunter class with DiaDora and took home the Reserve Champion ribbon as well. They finished 5th in the $1000 Junior Hunter Classic. They also just missed the second round of the $5000 Devocoux Hunter Prix. Libby and Specktacular got good ribbons in the Junior Hunters and 11th in the $1000 Junior Hunter Classic. Libby and Redfield Farms Joli Van De Groenedyck were 2nd in THIS Medal and got some great experience in the Grand Prix and other jumper rings doing the WIHS medal and USEF medal. Alexa Bayko and Clearly won an Amateur Owner 18-35 3'3" class and took home the Reserve Champion ribbon. They also finished 6th in the $1000 3'3" Amateur Owner Classic and 11th in the $1500 Platinum Performance Hunter Prix. Alexa and Celtic Blue won their first blue and Reserve Champion tricolor in the Adult Hunter 18-35. 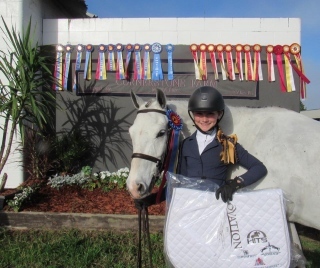 Lafayett Park and Grace Debney won a Large Pony Hunter Class. We we had some great girls from Rock Village Farm join us for the week as well. They did a great job at their first premier show on horses they leased. Abigail Thomas and McGraw got great ribbons in the Pre Adult Hunter's. Katelynn Wessen and Whisper got great ribbons in Pre Childrens Hunter's. And Alexandra Peterson got ribbons with Commander in Chief in Pre Childrens Hunter's.